This is the full story of Baby Duck’s first deer! I hope y’all will enjoy the read! It was tough to write but well worth the read! I would love to have this published in the magazine! Opening morning of the 2018 Eastern Firearms season for NC was a huge success for my oldest twin little girl, 8 year old Karli Ruffin(aka Baby Duck.) This story began to unfold back in July after my wife and kids had gone to visit my father Johnnie Ruffin for a few days. Daddy called me and asked when the girls would start shooting and be ready to hunt. He said they had both expressed an interest in getting started and even going hunting with him in a new club he had gotten in. It was actually Karsyn Ruffin(aka Peanut), who is Baby Duck’s twin sister who had shown the most interest according to my Daddy. After talking with my Daddy I began my search for a good youth model rifle and also placed a scope on a .22 I already had. I purchased a Savage Axis Youth model in .223 and placed a Pursuit 3-9x40 scope on it. The girls began practicing with the .22 and were very consistent from the first round of practice. After a few weeks of practice I knew they were ready. I talked with my Daddy and told him how well they were doing and about the gun I had gotten for them to use. He was excited for them and ready to take them out during the coming season. NC’s youth day rolled around and it was go time. The girls, their little brother (JT), and myself made our way to my box stand a friend had helped me set up. Peanut was going to have the first opportunity since she was the one expressing the most interest. We saw one doe that evening and as Peanut shouldered the gun and looked through the scope she told me she could not see the shoulders. The deer was standing perfectly behind a small weed. She had made a great decision in my book seeing as how she decided not to take a shot she was not comfortable with. We called my Daddy so they could tell Papa all about the hunt. Fast forward to the night before opening day. Baby Duck had decided she was going to get up and go hunting first thing opening morning. Her mother and I had been to a concert on that Friday night and arrived home around 1230 to find all 3 kids still awake with their cousin who was babysitting. I told Baby Duck if she was too tired in the morning we could go another time. She said she was still going! I had my doubts. I woke her up opening morning and she sprung from the bed. We got settled in stand at about 0620 and the wait began. Legal shooting time was 0648. We were down in a pine thicket in the same box stand we had sat in youth day. The area has a lot of deer activity and I felt it was the best place for the kids to see deer and maybe get their first. At 0703 I saw a big bodied deer come out in the path. After checking the deer through the binoculars to assure it met the minimum for a buck on our club I let Baby Duck know that this was a deer she could take. I positioned the gun on the rail and she then shouldered the gun and remained propped on the rail. She told me she was having a difficult time seeing the deer through the scope which was understandable given the low light conditions in the thicket that early. I had her open both eyes to find the deer in the path and then in the scope. She told me she could see him and was ready. I flipped the safety off and told her to take the shot when she was ready. She was calm and steady. When she fired the deer bucked up and away he went. While she may have been calm as a cucumber, I was shaking like a leaf! I told her I was pretty sure she made a good shot and we needed to wait about 30 minutes before going to look. That was a long 30 minutes for me as the excitement was only building. After the time period passed we went down to where the deer was at the time of the shot. We found scuff marks where he’d bucked up but no blood. We continued following scuff marks in the pine straw with no blood, stopping and looking around every 10 to 15 yards. After about 120 yards we found her buck laying next to some vines. I’m not sure who was more excited! 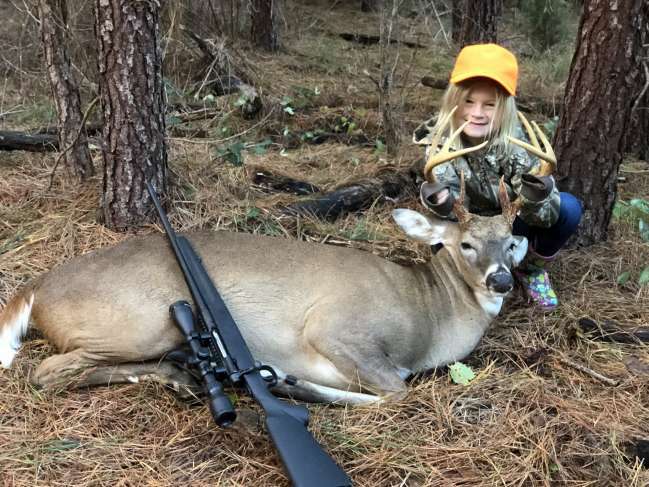 Her first deer ever! Very nice eight pointer weighing about 180 lbs. she had made a perfect shot just behind the shoulder and the bullet lodged in the opposite shoulder. As I was dragging him back to the path there was a point I had to take a break and Baby Duck decided she would help and drag him some. I videoed this and laugh at it every time I watch it. We took pictures and sent to Mom, My Daddy(Papa), and the friend who helped me get the box stand in there. Talked to her Mom and my Daddy on the phone pretty immediately after sending the pictures. Everyone was ecstatic. We took pictures when we got home and talked about the hunt. Her brother and sister were happy and excited for her and also had to have pictures with her and the deer. We showed the deer to several other club members also that morning. Everyone was excited for her. I talked to my Daddy later that day and shared the story. He was very proud of his Granddaughter! We decided we would be having a shoulder mount done and I dropped him off at Yankee’s Taxidermy in Kinston later that week. On the following Saturday my Daddy passed away after suffering a heart attack at home. During the following week I learned he had shown pictures of his Granddaughter and her first deer to everyone he had come into contact with. He had even tracked many of those people down just to show the pictures off. Had it not been for that phone call from my Daddy in July Baby Duck may not have taken this deer and he wouldn’t have gotten to see it! Take all the time you can with your family and enjoy the outdoors together. We are not promised tomorrow!